Dosimetry for power ultrasound and sonochemistry (J. Berlan, T.J. Mason). Nuclear magnetic resonance spectroscopy combined with ultrasound (J. Homer et al.). Degassing, filtration and grain refinement processes of light alloys in an acoustic cavitation field (G. Eskin). Sonochemistry in China (Y. Zhao et al.). Uses of ultrasound in food processing (T.J. Mason, L. Paniwnyk). 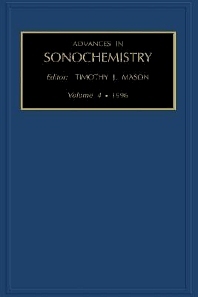 Sonoelectrochemistry (S.J. Phull, D.J. Walton). Index.